For some of us, there is an actual Soup Season- one of my best friends wonders why I bother to post soup recipes in the summer, “out of season”. I know I’m not alone in being someone who loves soup all year-long, but the soup I love has to have variety, unique flavors and ease of prep in the kitchen. 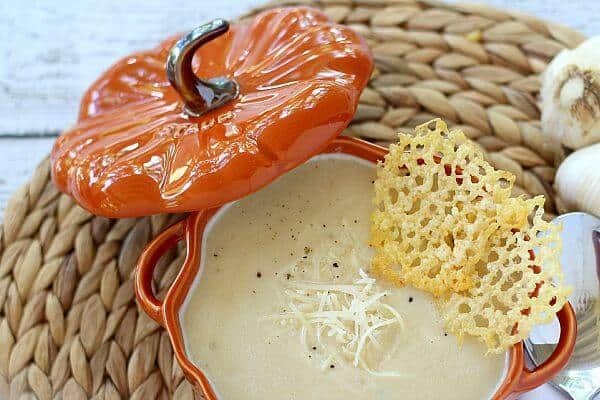 Roasted Garlic Soup has all of those requirements, and for you traditionalists I’m sharing a fantastic soup recipe at the beginning of fall- Soup Season. Roasted Garlic Soup is something I’ve wanted to accomplish for a long time and I’m glad I finally took the plunge. 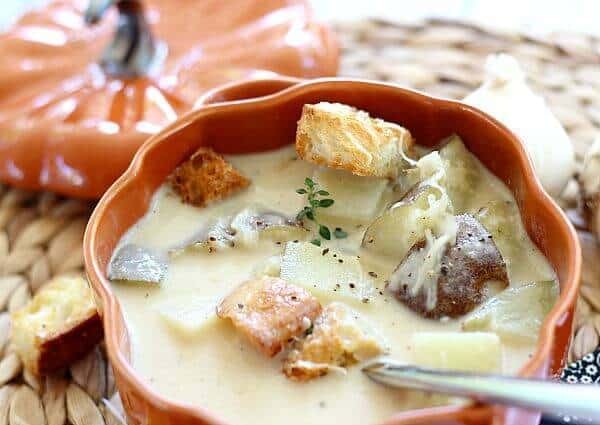 This recipe starts with a creamy garlic soup base, and builds into whatever your particular taste might be by adding options like russet potato chunks, Parmesan Crips, or toasted crostini croutons… take my advice and add ALL of these options! 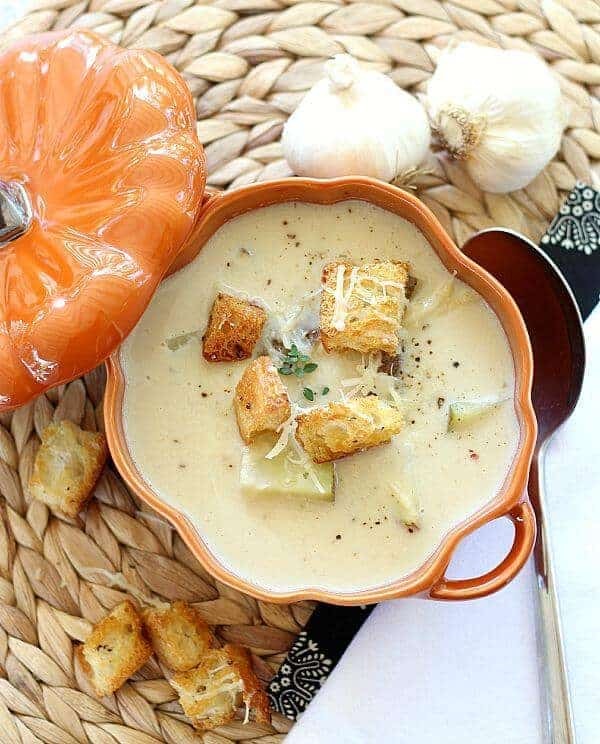 Over 40 cloves of garlic are used in this recipe, however Roasted Garlic Soup is not overpowering, but really smooth and earthy, almost like a nice cream of mushroom soup. For those of you who REALLY want your garlic fix, I suggest topping everything with additional quick-sauteed minced garlic for that sharp bite you get with raw garlic. It’s sure to give you ‘garlic breath’ for the rest of the day. In starting this recipe, only some of the garlic gets roasted in the oven ahead of time and this is something that could be done the day before. Having the garlic already roasted the day of serving makes this soup a true 30-minute meal. …and the Parmesan Crisps add a look of impressive adornment, and they couldn’t be easier to make! So, whether you make the creamy, light soup option or load it up with lots of texture and additional flavor, it’s sure to please… In or out of ‘Soup Season’. 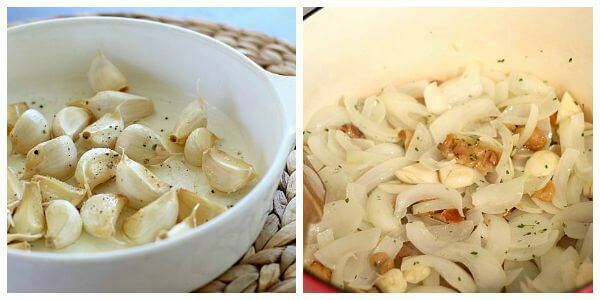 This recipe uses over 40 cloves of garlic! No, I promise it's not too much and the garlic flavor of this soup is actually subtle and richly creamy. Some of the cloves get roasted ahead of time in the oven; you can do this a day ahead of time. And the rest are simmered until soft in the broth. 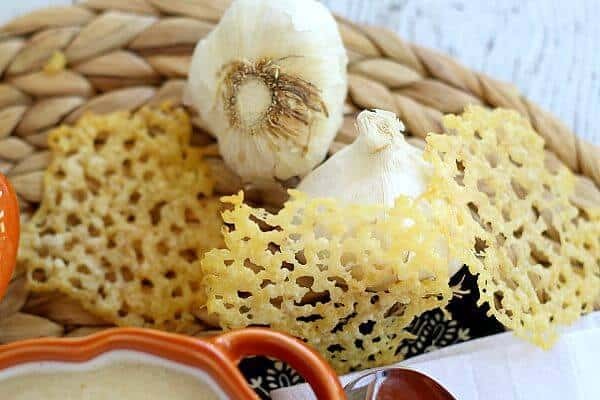 Since the garlic gets cooked to softness, this takes the edge off the sharp garlic flavor of raw or flash-sautee'd garlic. If you like some garlic with bite, feel free to garnish the soup with some raw cloves that have been minced. 4 lemon wedges, do not skip the lemon! Melt butter in a heavy, large saucepan over medium-high heat. Add the onions and thyme and cook until onions are translucent, about 5 minutes. Add the roasted garlic and 18 raw garlic cloves and cook a couple of minutes to release some of the raw garlic oils. Add chicken or vegetable broth; cover and simmer until garlic is very tender, about 20 minutes. Return soup to saucepan, add cream and bring to a low simmer. Add 1/2 teaspoon salt and 1/2 teaspoon freshly ground pepper. Divide the grated 1/2 cup Parmesan cheese among 4 bowls and ladle soup over. Squeeze juice of 1 lemon wedge into each bowl and serve. Cook's note: Do not skip the lemon! You won't believe how the lemon juice really brings out all the other flavors of this soup and without it, your Roasted Garlic Soup is a bit bland, believe it or not. If adding the optional russet potato for a chunky garlic soup, add the chunks of potato at the same time you add the chicken broth. Then cook until the potato is fork-tender. Continue with the recipe as written after this point. Serve in individual bowls garnished with more grated Parmesan, Parmesan Crips or toasted croutons, or the additional minced sauteed garlic. I highly recommend adding ALL garnishments. For Parmesan Crisp garnish: Heat your oven to 400F degrees, Pour a heaping tablespoon of grated Parmesan onto a silicone or parchment lined baking sheet and pat down just a bit. For color or extra flavor, you could sprinkle the cheese mound with herbs, black pepper or red pepper flakes. Repeat with as much Parmesan crisps as desired, spacing the spoonfuls about a 1/2 inch apart. Bake until golden and crisp. Since ovens vary, this time can be anywhere from 3 to 10 minutes (mine finished closer to the 10 minute mark). The cheese will bubble quite a bit, but just keep cooking until the crisps darken. Cool, then using a spatula, carefully scrape the crips off the baking sheet and serve with the soup. If you prepare the roasted garlic ahead of time, this soup is ready in around 30 minutes. Otherwise, plan for just under 1 1/2 hours total time. 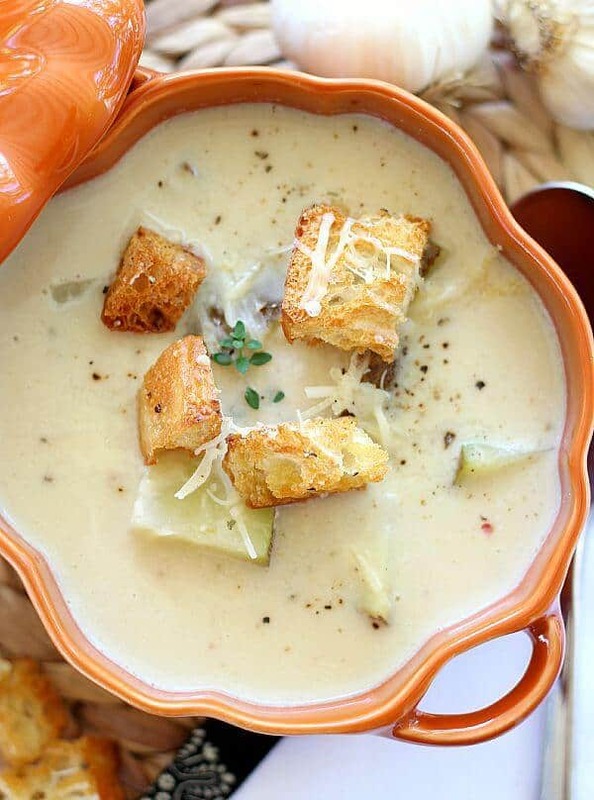 The Parmesan Crisps can be prepared while the soup is simmering, if you're including them. I had some leftover roasted garlic mashed potatoes I blended in with the soup. It was a nice addition. This is the best go-to soup when you’re sick. Anyone try it with coconut milk instead of regular milk? Hi Fabulii, I’ve used almond milk with success. I’m not sure how coconut milk would taste since the coconut might add a sweetness to the soup. Excellent point. Thanks! Even though I still consume limited dairy, when you’re sick it’s the last thing you need. So delicious. My husband agrees what a quick easy soup! Will definitely use this recipe again. Thank you Christy! This is one of my favorites as the weather starts to turn (actually we like it any time of year around my house). I’m so glad you liked it and appreciate you stopping by, taking the time to comment. This sound like MY kind of soup Sally. You know I can’t resist garlic. Bonus: I’ve never had a single problem with vampires. We love roasted garlic (who in their right mind wouldn’t) and the idea of creating a soup it sounds wonderful. This would be perfect for the cold weather that is just around the corner. 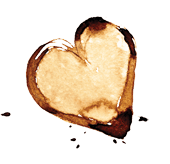 We love your site and are very happy to have found it; beautiful work you do! I see you have a new format on your website. I love it! Great change and very professional looking. Can’t wait to make this for when the cold and flu season hit. Mamalala, Thanks for your comment about the site. I have an excellent team working on it and it’s still evolving so stay tuned. 😉 And I hope you enjoy the soup. Let me know what you think of it after you try it. 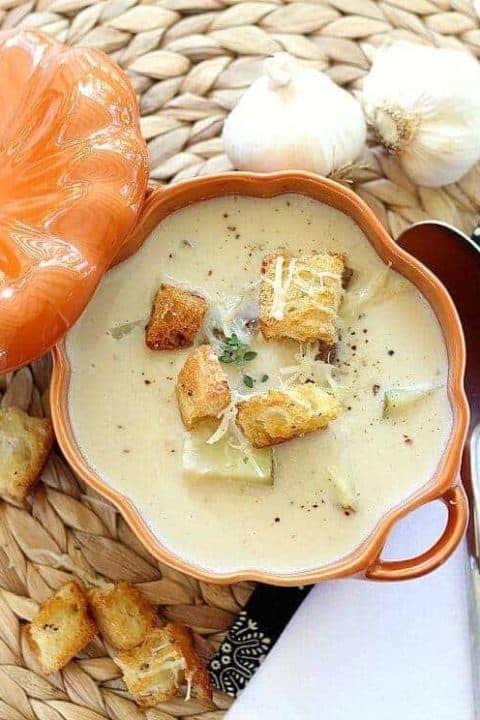 This soup looks heavenly, love roasted garlic. Doesn’t the aroma that permeates the kitchen just make you feel good? It is a wonderful smell and this sounds fantastic, especially with those Parm crisps!